Inverness, meaning "mouth of the River Ness," was founded as an ancient settlement during the Middle Ages as a fishing village and home to several monasteries. The medieval period was a tumultuous time and the town had been pillaged and set on fire on several occasions. During the 16th through 19th centuries, the town was reborn as new buildings, churches, and a railway system that brought both tourists and goods to the town. In 2000 Inverness was made a city and boasts an economy centered on distilling, shipbuilding, and engineering. Most recently tourism has provided a huge boost to the region. Round-trip route with on/off privileges in Inverness City! Climate controlled buses with wheelchair access! Easy to use system map of the Inverness City! Audio narration on the bus! Optional Family Pass to save more money! 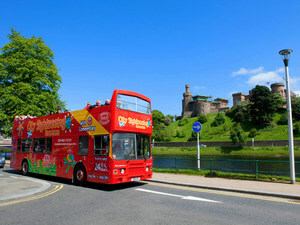 See the best highlights of the city in this Inverness Excursion aboard the double decker hop on hop off sightseeing bus. Ride the loop or hop off to explore. This is the best way to get around and learn more about this interesting city.